There's no law that mandates brides to serve up a beige, tiered wedding cake to her guests. In fact, while the multi-layered cake has become a staple of weddings everywhere, it may not reflect the personal style and taste of the happy couple. Almost anything is possible in the bakery and those shopping for the perfect cake should take into account often overlooked details like, shape, trimmings, and color. ... 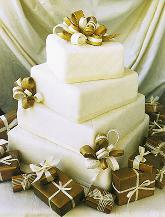 Traditionally, wedding cakes have either been round or square. From a practicality stand point, these time-honored forms offer easy cutting and serving, as well as the least amount of waste. ... But wedding cakes can be made in any shape - hearts, ovals, or hexagons. A clever baker can even mold cakes into the shape of a home, a car, or almost anything your imagination can conjure. ... A cake's flavor is it's most important feature, but one that is frequently taken for granted. A cake can assume almost any flavor at all. ... Popular cake flavors include, vanilla, chocolate, and strawberry or a marbled blend of the three. A wedding cake may even be made from the ingredients of the bride and groom's favorite dessert. Why not request a cheesecake, carrot, or spice wedding cake? Your baker may even offer special fruit fillings in his cakes such as strawberry, raspberry, or blueberry. ... White-colored butter cream frosting has long been a staple of wedding cakes. But why not tint the wedding cake to match the wedding colors? Another popular suggestion is to cover it in flowers that match the bride's bouquet. ... A wedding cake can be displayed in virtually any fashion. A tiered cake has a classic elegance that most wedding goers will appreciate, particularly if a little creativity is used to highlight the levels. ... For instance, glasses matching those used at the reception could be used to support the tiers. Transparent plastic or glass columns will lend each level the appearance that it is floating above the rest. ... At the top, some brides are sidestepping the tradition of using bride and groom figurines and are instead adoring the last layer with, fruit candy or flowers - either fresh or those created from frosting. And while it isn't customary to serve wedding cake with a side delight, why not consider including a scoop of frozen yogurt or ice cream with each piece? A sweet chocolate or fudge sauce can richen the most understated cake flavors. ... The bottom line is, a wedding cake should reflect the individual tastes of the people serving it. As the last taste your guests will experience at your ceremony, it should be sweet enough to leave them with fond memories of a joyous occasion.